All cash, futures and options although futures and forex may substitute end of day summaries and trade count data. All markets and all-time frames. 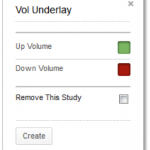 There are no parameters to select for either the Volume or Vol Underlay indicators in Technician. To remove the study from the chart, click the “remove this study” check box. It will only appear if the study is already on the chart. 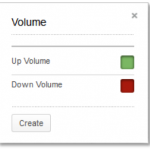 Volume is simply the number of shares, contracts, or units changing hands in a given period (day, week, hour). It is reported in real-time (or delayed) with each trade. Markets that do not have trade-by-trade reported volume substitute daily summary data or trade count data. Trending markets should be accompanied by rising volume. Exhausted markets are usually accompanied by falling volume or unusually high-volume spikes. There were signs available to be read when CSL peaked in 2014. Here we see the CSL score a higher high in price but a lower high in volume on its very last push. When the trendline broke down, volume soared to confirm that a significant change had occurred. Later, we can see a bullish divergence in volume as price made a lower low. Keep in mind that volume divergences are more meaningful at tops rather than bottoms.